Blog > Catch the Fishmas spirit! Some of the best holidays are invented (Festivus, anyone?). Lovers of all things aquatic have something to celebrate in December: 25 Days of Fishmas! And don’t worry, you don’t have to scour the mall for presents – just hop on Twitter to participate. 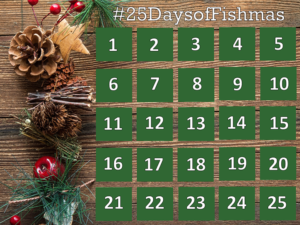 Just look for the #Fishmas or #25daysofFishmas hashtags on Twitter. Said Katie, “I saw the poster and was reminded of an advent calendar… only instead of candy, you got facts about Great Lakes fish species!” Each day on Twitter, she’ll feature one species–either native or introduced–and, through a series of tweets, share interesting background information. 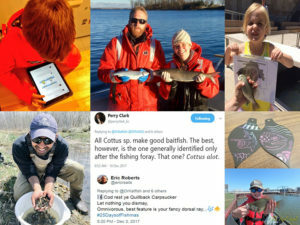 “Part of the reason I did the first 25 Days of Fishmas was because I wanted to share all of the cool things I had seen as a grad student studying Lake Michigan coastal wetlands. For a lot of people, seeing Great Lakes fish isn’t a common thing (‘out of sight, out of mind’) and they don’t usually know about lakes’ diversity of fish,” Katie added. One of the most gratifying things she’s found is that many tweeters have shared their personal memories about the Great Lakes. A recap of some of the highlights of Fishmas 2017. Katie credits the Great Lakes Sea Grant programs for embracing the Fishmas spirit and keeping a lively dialogue going. Some of its most prolific tweeters are Solomon David and Wisconsin’s own Titus Seilheimer, aka @DrFishSG, who is fired up for this year’s piscine posts. With a decade of experience working on the Great Lakes, Manitowoc-based Titus chimes in with pictures or stories about wetland fish, commercial species, or interesting things happening in the food web. “My favorite species are usually the underappreciated ones like the central mudminnow or tadpole madtom. More people haven’t heard of them, but those who have been stung by the venom on the tadpole madtom will remember them,” said Titus. We hope you’ll catch the spirit and log on to the discussion. Happy Fishmas, one and all! This entry was tagged communications, Fishmas, Katie O'Reilly, scicomm. Bookmark the permalink.